By every measure these motor sports writers should have known better. Just two months earlier, with the same car, Wagner had triumphed at the 100 kilometer Circuit des Ardennes race on August 13. As for the endurance of his machine, its predecessor of 1905 should have laid to rest all its critics’ concerns. 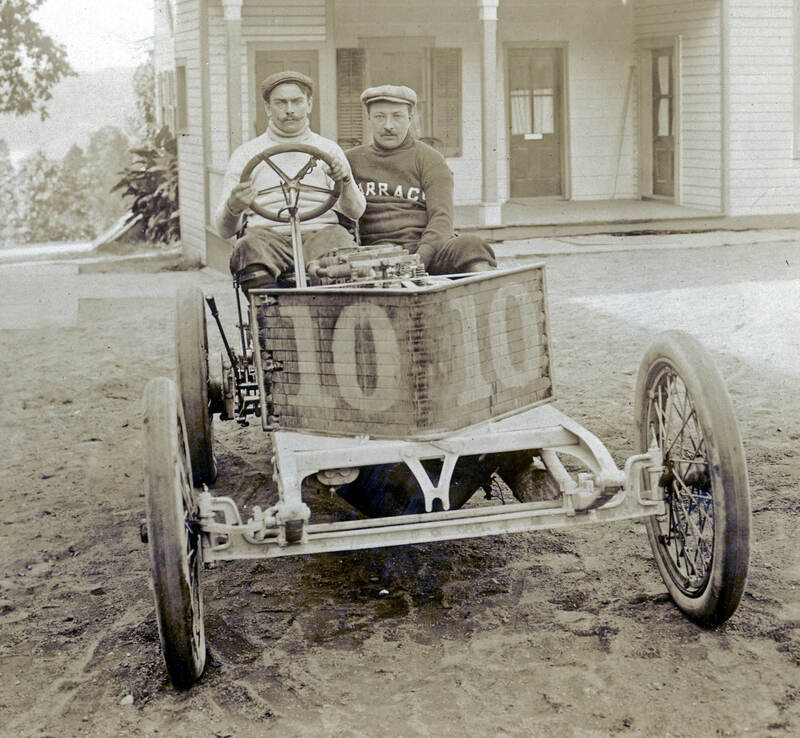 The 1905 car weighed less than the 1906 model by 96 pounds and sported the same deceptively fragile looking wire wheels but triumphed despite appearances. The 1906 Darracq weighed in at 2,156 pounds with a wheel base of 96 inches and a track (from one wheel hub to the other on the same axle) of 53 inches. Mounted on the wheels were Michelin tires. The four cylinder engine that powered it had a bore of 7 inches and a stroke of 5.9, making for an engine capacity of 908 cubic inches. Estimates of its horsepower rating ranged from 100 to 110. The car had a three speed transmission with a reverse gear and used what was called a cone clutch, common during this period. The car had two brake systems. Brake shoes were activated to drag on the rear wheels through a pedal and a hand lever applied a brake to the transmission. The car used a drive shaft as opposed to the more conventional chain drive systems of the time. According to The Motor Way the Darracq’s frame was constructed of “sheet iron” and used Tuffault-Hartford shock absorbers. This supported not only the engine but a 30 gallon barrel style gas tank and an 8 gallon water tank. The honeycomb radiator contributed heavily to its odd appearance as described in the newspaper accounts. Unlike its 1905 predecessor’s square box style radiator, the 1906 version was more of a triangle with two sides jutting out from the uncovered engine like the blade of an ax. 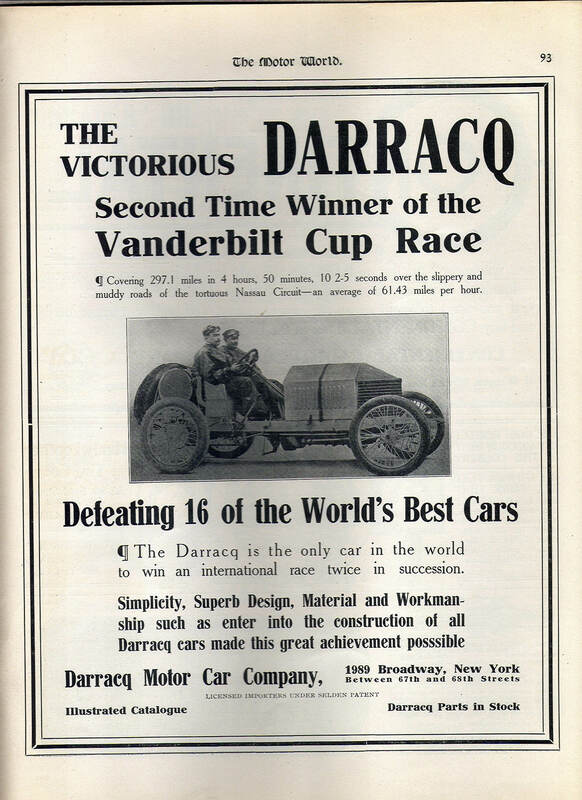 D uring the 1906 Vanderbilt Cup Race, Wagner's Darracq led all ten laps, winning the race with an average of 62.7 mph. By some accounts the car still exists today and as of 2011 was in New Zealand under the ownership of Anne Thomsen and her husband-mechanic Wallace McNair. Among its distinguished prior owners is Sir Malcolm Campbell, known for his world land speed record drives in his “Blue Bird” racers during the 1920’s and 30’s. Campbell purchased the car in 1910 and used it to compete at England’s Brooklands track until 1913. 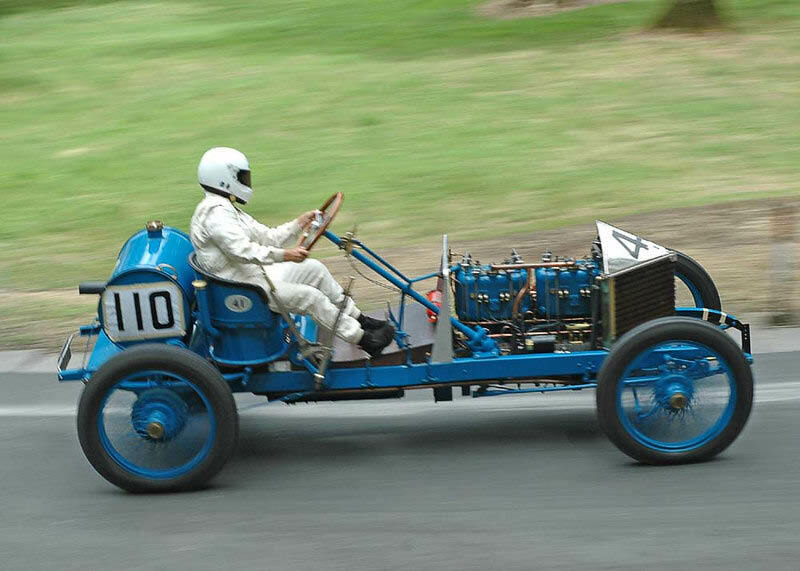 Author and amateur race driver Neville Minchin purchased the machine in 1914 and introduced several modifications including a four seat touring body, a four speed transmission, center lock wire wheels and electric starter. He also drove it in Britain’s “Four Inch” Tourist Trophy in 1914. 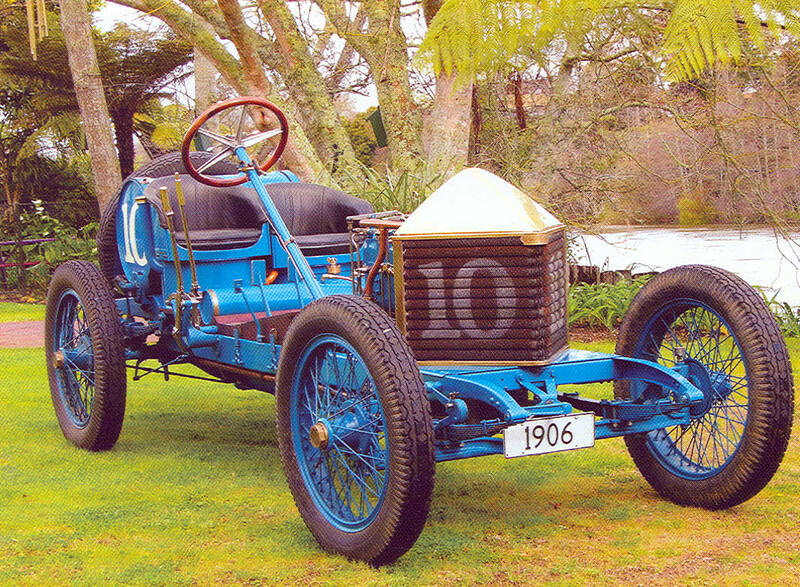 The car was brought to New Zealand shortly after World War I by a naval officer. At one point the engine, according to McNair, was used to generate electricity for a newspaper office. The current owners enjoy the machine and have demonstrated its prowess at vintage racing events.